At first squirrels are adorable creatures who quietly nibble nuts while sitting on your fence. But before you know it, they can become a nuisance and wreak havoc on your property and belongings. 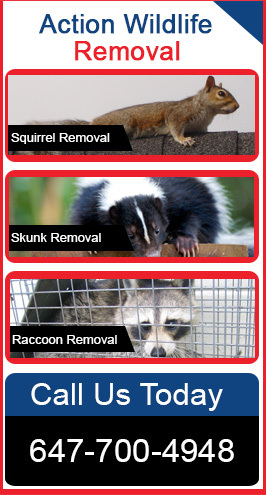 At, Action Wildlife Removal, we provide squirrel removal and control services in Mississauga, Brampton, Orangeville, Caledon, Bolton, Guelph and Georgetown. We will be your trusted partner in regaining control of your attic or backyard. Our expert squirrel technicians offer safe, fast and efficient wildlife removal services to residential and commercial customers. If you hear strange noises coming from your attic, but not sure what animal it is, contact our wildlife removal services. Our trained professionals will visit your place to identify the culprit. Once we identify the pest as a squirrel, we will carry out the best possible solution to prevent these critters from your property. We will also show you the areas where they have gnawed holes to gain access to your attic. Our experts will also inspect the entire place to check for other vulnerable areas and secure these areas with rust proof screens to prevent them from getting back in. At Action Wildlife Removal, we implement sustainable and integrated pest management strategy to eliminate squirrels completely. We aim to provide your property with long-term wildlife control solutions. Squirrels are most commonly found in the attics and can cause severe damage to attic insulation. They can chew the electrical wires and other plumbing fixtures as well. As more litters of squirrels are born, these squirrels grow up and start building their nests within the attic. It is crucial to control the population of squirrels otherwise they will continue to chew holes and create entry points to your home. The best way to prevent squirrels from the attics is to trap them and relocate them to areas away from the home. Action Wildlife Removal uses state-of-the-art squirrel removal methods to efficiently catch all squirrels and prevent them from gaining access to your attics. Our technicians identify all the potential entry points and seal holes once they are sure all squirrels in the attics have been trapped. Another solution for getting squirrels out of attics is one way doors. Our technicians will set one-way doors at each attic entry points so that once the squirrels leave the attic they won’t be able to re-enter the attic. Squirrels quickly migrate to different places and cause significant damage to the property. In order to deal with these little monsters, you need the best squirrel removal services in the GTA. At Action Wildlife Removal we provide comprehensive squirrel removal and control services to ensure your property is fully guarded against these unwelcomed guests. Our professionals will safely and thoroughly remove the squirrels from your home. Contact us 647-700-4948 now to schedule squirrel removal services in the GTA.